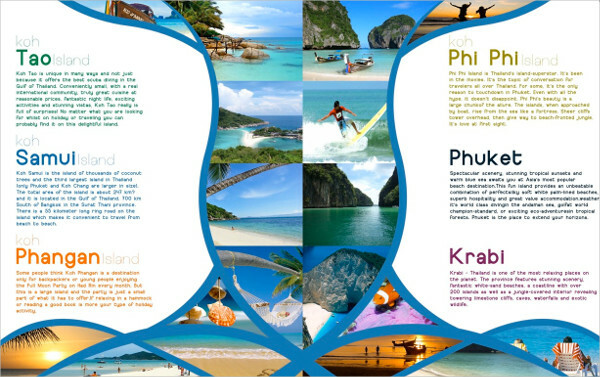 A travel brochure is a type of brochure, often from a travel agency, that advertises holidays, hotels, and other great vacation spots. It includes a description of a destination, hotel, service, or tour with the intention of promoting the businesses that offer them. They can be mailed to prospective customers to make sure that they are actually read, or they can be displayed in brochure racks and have them available at offices and other business locations. This is the first thing that people will see, which means that it could make the difference between your brochure being picked up and perused, and being left in its lonely rack to rot. A mere glance at the cover should answer three things: 1. Who is advertising? Where are you located? What are you selling? Make sure that the cover is visually compelling to pique the audience’s interest, but keep it simple and use only professional quality images. Tell your potential customers not only what you are offering, but why they will enjoy it, what they can get out of it. You need to make them think that the offer is more for them than for you. But you can only do this if you first have a good knowledge of your target audience, so research this if you haven’t already. Create a personal message to that audience, letting them know why they specifically should participate in your offering. Your brochure should focus on one specific objective. If you are announcing new offerings, make sure that the brochure explains them and their benefits. 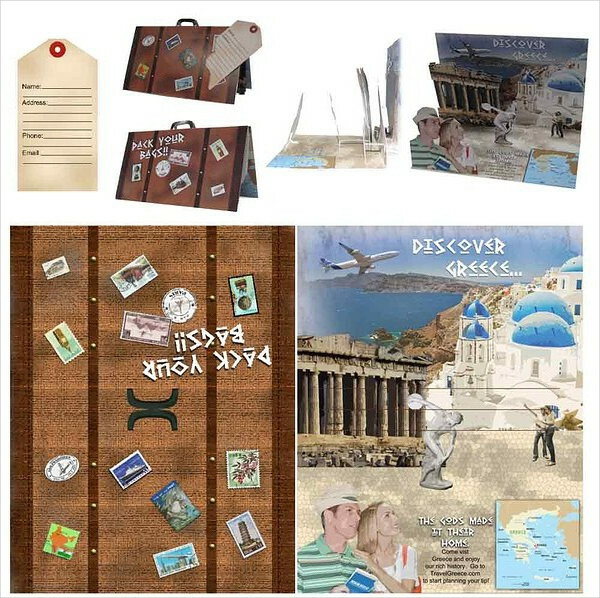 A brochure that is intended to describe a travel product should be detailed and provide plenty of pictures and descriptions. You should include a statement telling people what you want them to do next and how they can become involved. Describe the facilities completely and include attractive photographs. Discuss information about special services, promotions, and events. Tell them what differentiates you from the competition. Relate to them the exact reasons why they should choose your services even if they didn’t plan on doing so in the first place. List not only the facilities and activities available to your guests but also any public sites that they may be able to take advantage of during their stay. Entertainment is an important part of travel. Show them how you can help them have fun, so be sure to include all the relaxing and entertaining things your guests will experience with your travel product. 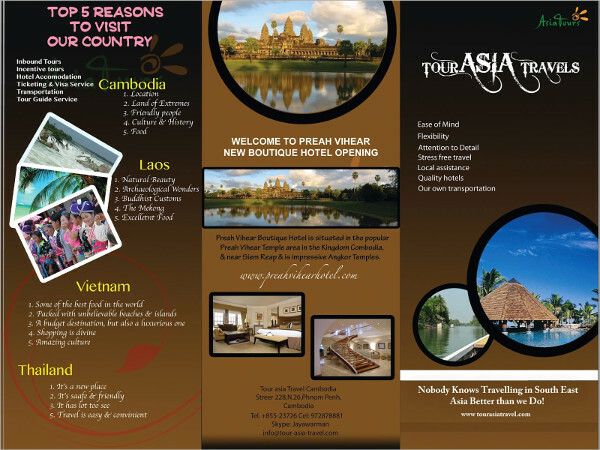 A lot of travelers consider travel brochures a necessity. 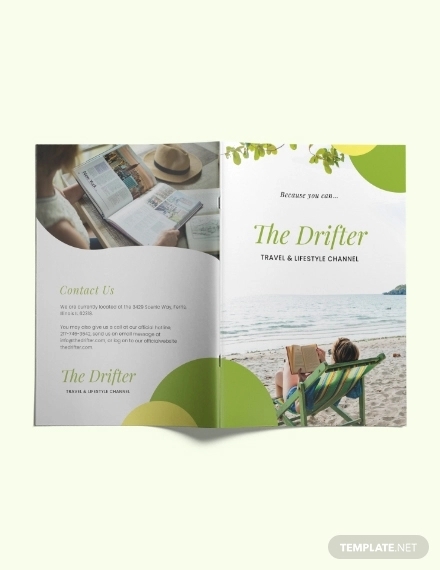 In fact, they often collect brochures and other travel literature when planning a holiday, which is why travel brochures are considered a very effective marketing tool. Five-star resorts are not the only ones who need travel brochures. 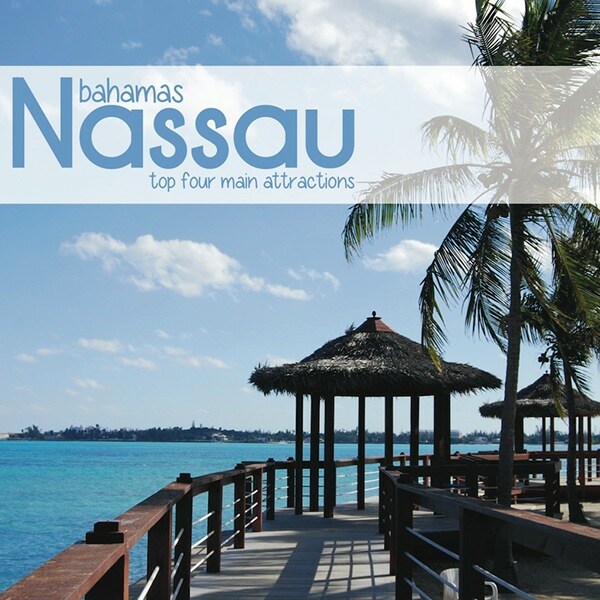 As long as your business is in a city or a town considered to be a tourist spot, it’s a need. 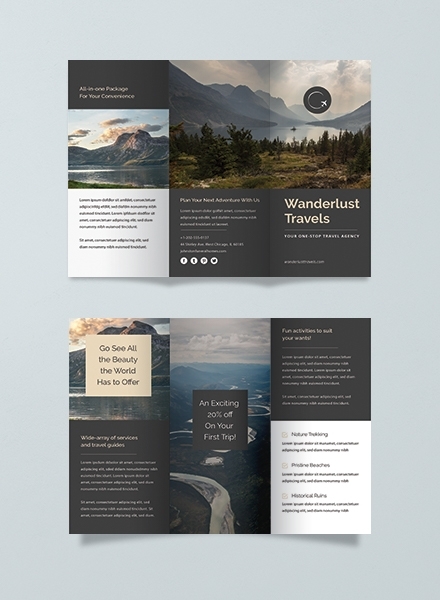 Making a travel brochure takes time, effort, and creativity. 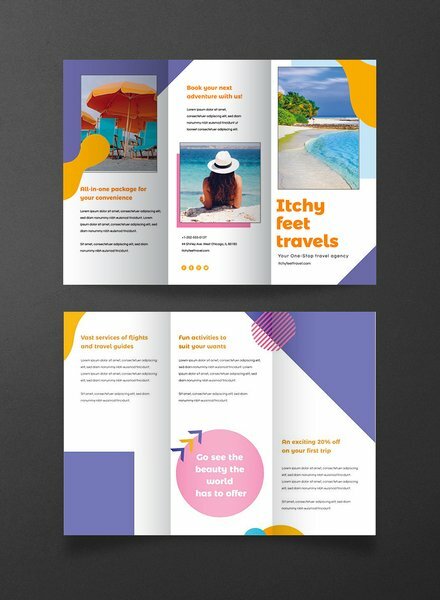 Whether you are creating a travel brochure for a school project or for a business, the main purpose of a travel brochure is to introduce tourists to a place and provide itinerary ideas. Here are some tips on how to get you started with that. 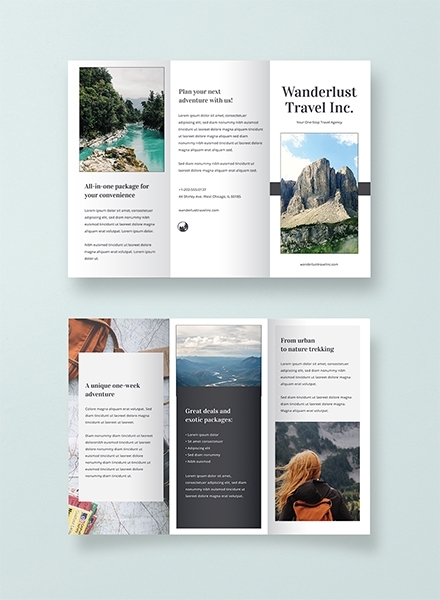 The first step in creating a travel brochure is deciding on what content you are going to include. You can focus on a brief history of the place, trivia, travel guides, shows, and activities, and a map of the place. 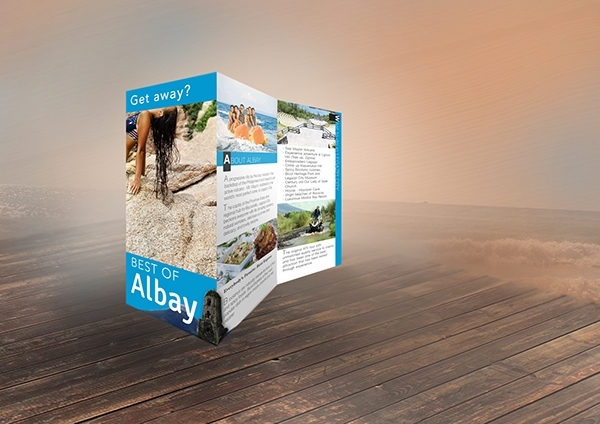 Use the internet, local periodicals, and magazines to gather the information you need to create your travel brochure. 2. Choose a design layout. In order to make the travel brochure interesting, you need to consider the photos and graphics that you are going to put in your brochure. It is best not to crowd it though with tons of pictures but to include enough to make the brochure interesting. It is important to pick a specific design for your brochure. Do you want a business look? A casual look? A trendy look? The best choice really depends on who your target audience is and the message you want to convey. 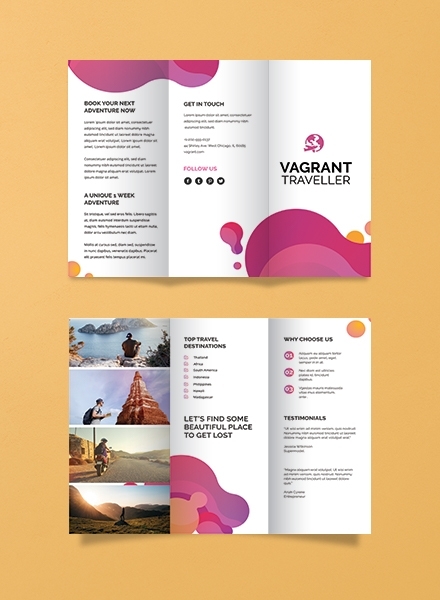 There are a lot of travel brochures to compete with, so you might want to consider choosing a design that stands out from others. 3. Choose paper quality and size. 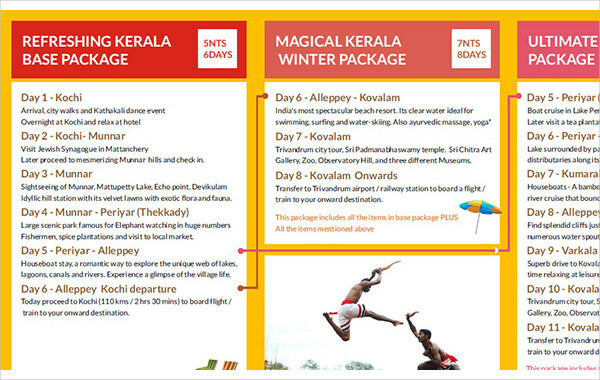 The quality of a travel brochure is important. After all, there’s a big chance that your audience will actually bring it with them on their next travel. So try to pick something sturdier than plain paper. 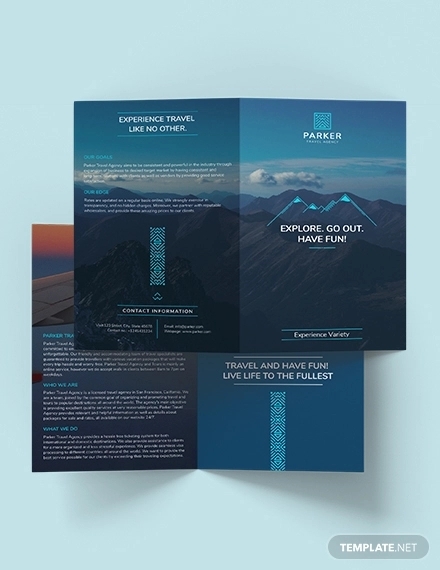 Decide if you want the brochure to be printed on hard cardstock paper so that it can stand on its own or if you want a thin flexible brochure that can be folded up. What size do you want your brochure to be? 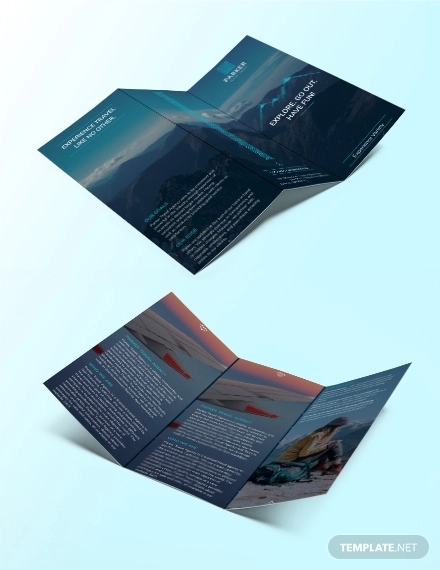 Do you want a bifold brochure, a trifold, horizontal, or vertical? The front cover should have pictures of the place. 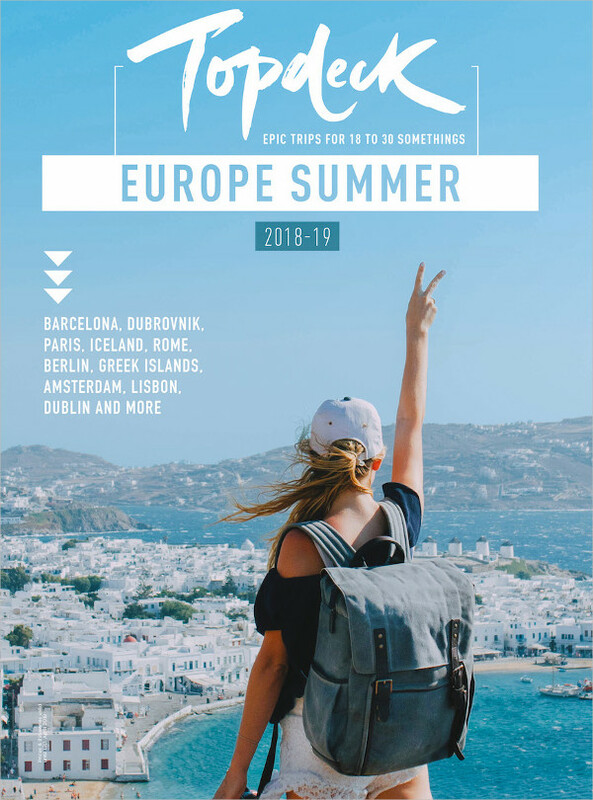 The inside pages should include important information such as the itinerary, places, shops, restaurants, and a travel guide. You can attach a map to the last page and a tourism hotline number or visitors bureau information for emergencies. 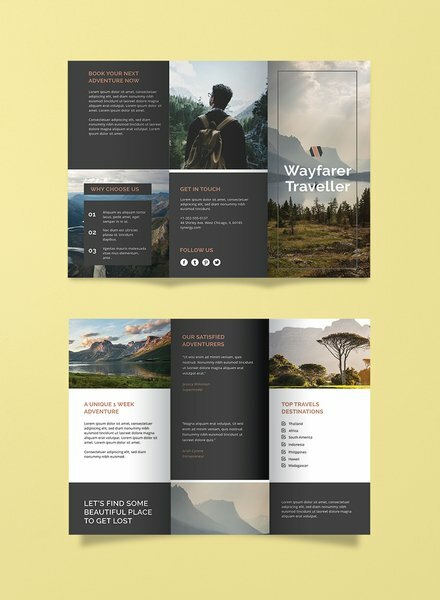 Here is a series of pro tips that will make the difference between creating a good brochure and a great brochure design. 1. Know your purpose before you start. When you’re thinking about how to design a brochure, start by asking clients why they think they need a brochure. Then ask them to define their objectives. Sometimes they just want one because their last brochure didn’t work for them. If they’ve come up with a good answer for you, take a step back from that and look at exactly what it is that they are trying to achieve, and make that your goal too. 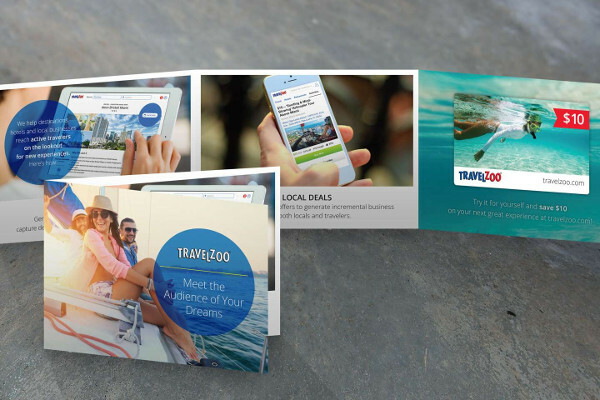 Your brochure should, first and foremost, answer to the needs of your audience. You don’t need many fonts when you’re thinking of how to design a brochure. Just a heading, subheading, and body copy front. Finding a headline font that nobody has ever used before is such a wrong concept. Clients will usually take the lead on fonts as they often have a corporate identity already in place. You don’t need to take extra lengths to discover a new font. 3. Take stock of your paper stock. Talk about paper stock before you start putting that pen to your notepad. If you’re working for a client, ask him if it has to be the standard A4. Find out if they have considered using uncoated paper, for example. Paper is an important, often underrated, aspect of creating a brochure. 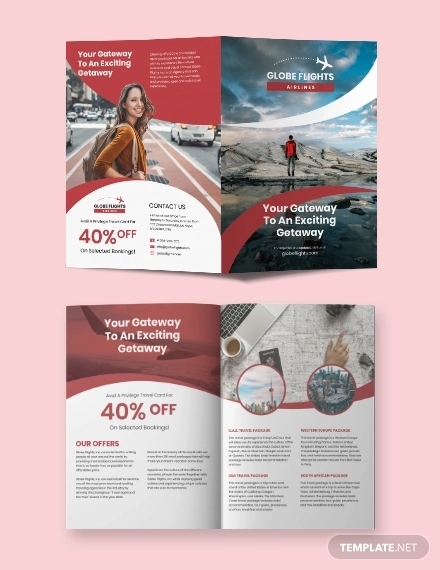 Good paper is an effortless way of making your brochure effortlessly attractive, while also making sure that it that the brochure will not be ruined when touched by a little rain. 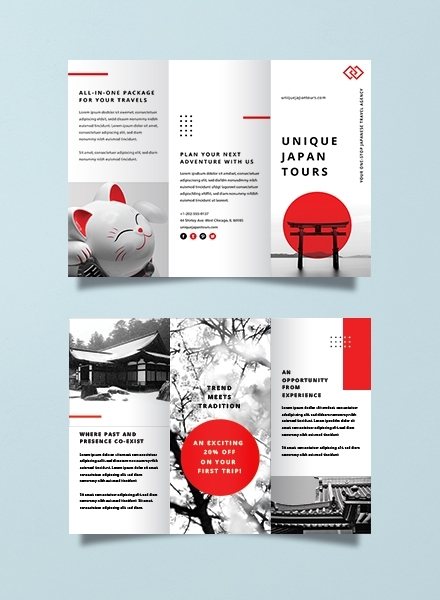 When thinking of how to design a brochure, keep the end purpose in mind. Is this a brochure that’s going to be posted out in response to requests made on a website? Is it a giveaway at an exhibition, or a leave-behind brochure? When someone opens it, what will it say to them? Design for your audience, not for your business. 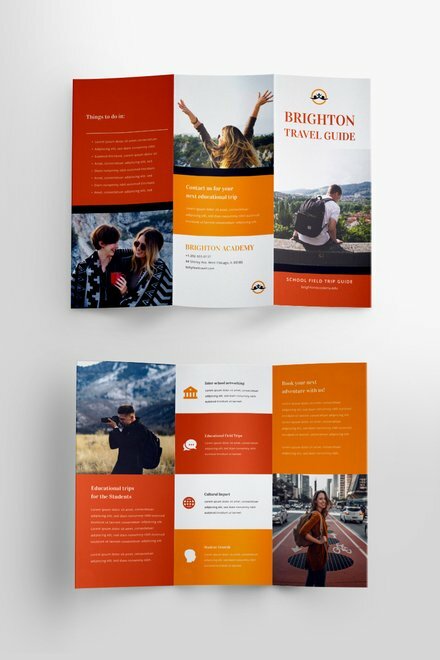 You want to know how to make a brochure that stands out? Well, here’s the secret: simple ideas are the best. If a client has decided that they want lots of cliched images to get a particular point across, it’s probably better to scrap them. The solution might lie in using a typographic cover instead, and make a very literal statement about what they want to say. Don’t try to be wacky or different just for the sake of it when you’re thinking of how to design a brochure that will get noticed. For example, most designers use the same 10 to 20 fonts across a lot of the projects that they work on. There are sound design reasons why Helvetica is used a lot, and why Rockwell is a good headline font. 7. Make a good first impression. 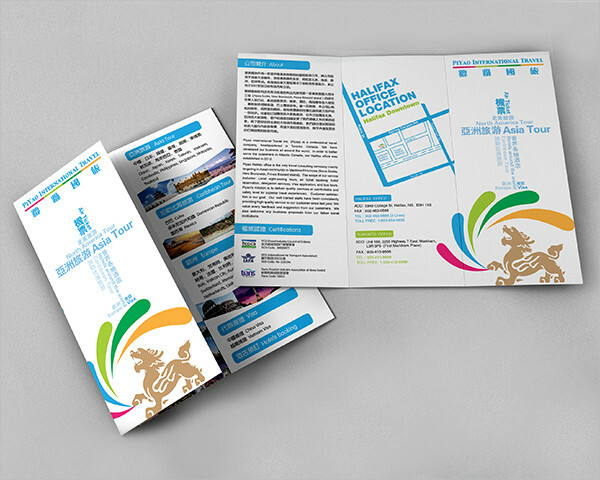 Brochure designs need to fit in with what the client does as a business. 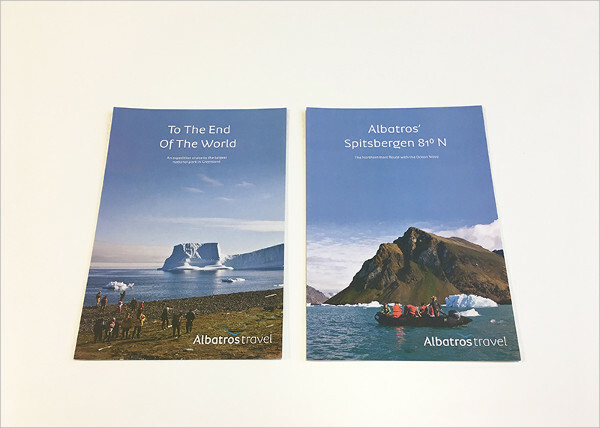 Charities don’t want luxury brochures that will make people think that they have spent a lot of money on them, money that they can spend on the charity instead, whereas a new product might need a brochure that looks amazing on an exhibition stand. Understand what the brochure needs to achieve and help it achieve that. To make a product brochure pleasurable to flick through, you need good photos. If you’re using stock imagery since the budget doesn’t always stretch to include a photo shoot, try to find pictures that don’t look like they are stock images. Brochures are basically classified according to their layout, like their method of folding and the overall appearance of the brochure. Gate Fold Brochure. These brochures are fairly uncommon, but when used correctly, they can have a great impact. The main reason they are rarely used is because of their cost, which only high-end marketing can afford. These brochures are made out of fine quality paper that make them durable, while also effectively reaching the targeted customer in good condition. As a unique feature, the inward folding of this brochure makes it easy to carry. 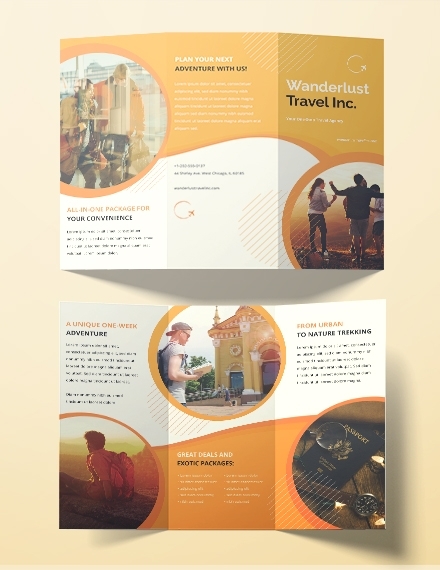 Trifold Brochure. As the name suggests, this one has three folds. It provides you with enough space to present your information as it creates six panels. These are a very common type of brochure because it’s considerably cheaper and still have the capacity to impress the person reading it. Bifold Brochure. This is the most common type of brochure used by many companies since it’s cheap. The simple layout also makes for an uncomplicated printing process. The paper material is folded in half forming four panels: the front cover, the back cover, and two internal panels. Its format makes scanning information easier. It will be like browsing through a really short graphic novel. This type of brochure is useful for companies who need more space for advertising. 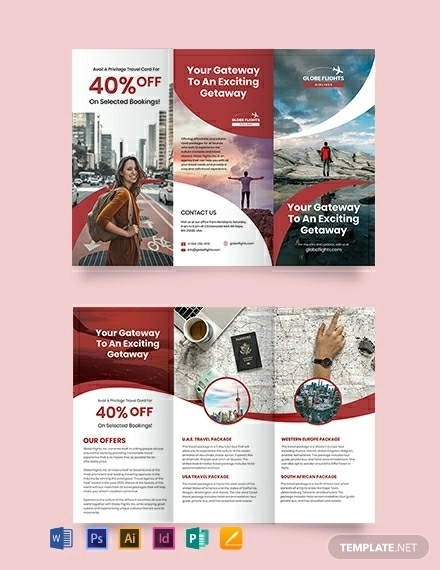 Leaflets or Flyers. A leaflet brochure is different from all the other types that we have discussed because this one is meant to target a large number of people. However, it’s a fairly common item, which means making your overall presentation unique can be a challenge. A leaflet has only one page, which makes the printing cheaper. Plus, it’s also very user-friendly since all the information can be found in one place. Folders and Inserts Brochures. 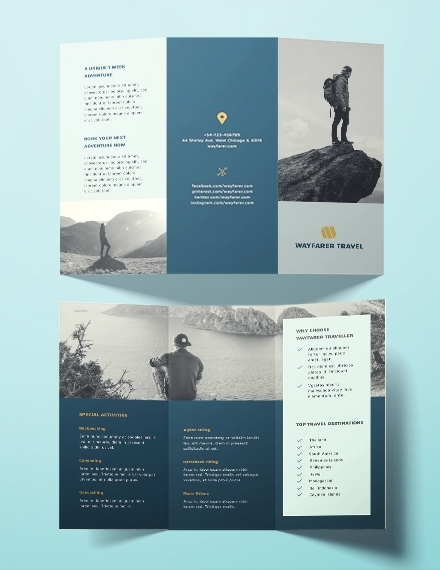 These brochures have an additional feature of folders within the brochure, which is useful for storing feedback forms or enrollment forms for accessibility. Trifold. 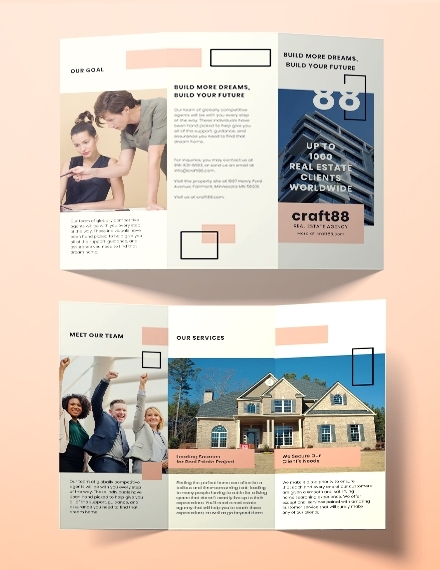 8.5 × 11 inches is the most common size for trifold brochures when they are opened or flattened. But 8.5 × 14 inches, 11 × 17 inches, and 11 × 25.5 inches are also accepted sizes. Half Fold. It’s easy to open; book style is usually 8.5 × 11 inches in size. Quarter Fold. A finished quarter fold is 5.5 × 8.5 inches, a size perfect for mailing. Half or Trifold. This type is meant to accommodate a larger sheet, which is why it’s 11 × 17 inches in size and uses a #10 envelope for mailing. How do you make a pamphlet with paper? Fold the paper into a brochure. Turn the paper so that panels 1, 2, and 3 are facing you. Fold the narrow panel down first, then fold the outer panel on top of it. Make sure that the side edge of the outer panel touches the folded edge of the inside panel. How can I write for a brochure? Determine the audience for your message. Decide on the purpose of your brochure. Is it meant to persuade, inform, or advertise? Think about the message that you want to convey to your readers. Write the text for your brochure. Decide on what graphics you are going to use to visually enhance your brochure. Travel brochures are just another form of marketing strategy. Although social media sites are a reliable platform, as a thriving business, you must grab every marketing opportunity.